This simple salad is delicious as an accompaniment to meat or fish, or just as good on its own with crusty bread. Wash and trim the radishes. Cut the Little Gem lettuce hearts into thin wedges, discarding the root. Cut the radishes into thin slices. Scatter the Little Gem wedges and the sliced radishes over a platter. Warm a frying pan over a medium heat. Add the walnuts and dry-fry for 2-3 minutes or until fragrant and starting to colour. Finely chop the juniper berries and mix with the vinegar, oil and some salt and pepper, then whisk together. 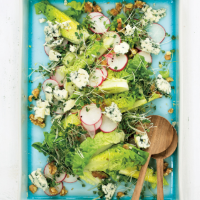 Drizzle the dressing over the salad then cut the cress from its roots and scatter over the top together with the walnuts and cheese. Serve immediately.